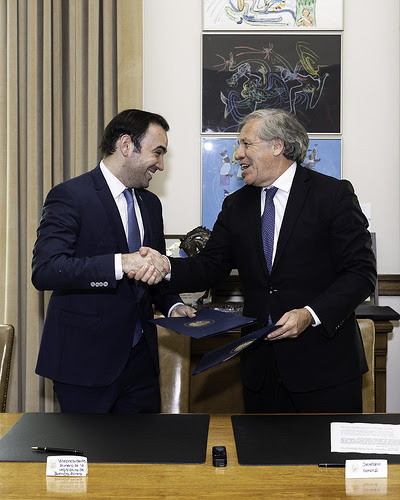 The Organization of American States (OAS) and the Legislature of the Autonomous City of Buenos Aires today signed an agreement to modernize and provide greater transparency in the management of the legislative body. The First Vice President of the Legislature of Buenos Aires, Francisco Quintana, highlighted the common values shared by the Buenos Aires legislative body and the OAS, adding that the agreement aims to "work on issues of innovation, transparency, accountability and political communication." For his part, the Secretary General of the OAS, Luis Almagro, indicated that this step seeks to modernize the legislative body and make it more efficient to achieve more rights for more people. "The democracy of the 21st century demands a real-time and unhindered approach between those who hold political-legislative power and the citizens."